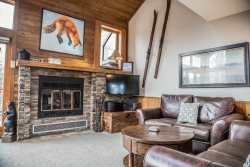 Located in the heart of the Gunflint Trail near the Boundary Water Canoe Area Wilderness. Nestled on the shores of one of northern Minnesota’s most pristine lakes, the Clearwater Castle is a dream home up the iconic Gunflint Trail. Featuring four bedrooms, two and a half bathrooms and additional sleeping space on the lower level, this spacious lakeside getaway is perfect for all occasions. A literal ‘wall of windows’ in the living room grants you sweeping views of Clearwater Lake and its many majestic bluffs. This gorgeous lake received its name for a specific reason, as its water clarity is unmatched nearly anywhere else in the state. Lake trout, moose, bears, wolves and other unique wildlife call the area in and around Clearwater Lake their home, so they’ll be some of your neighbors during the trip. In fact, it’s not unusual to spot some of these North Woods animals right out of the windows while enjoying a morning cup of coffee. Also featured on the property is a charming sauna, which is perfect after an invigorating swim or a quick dip in the cool waters of Clearwater Lake. Few things are more in tune with the harmony of the Gunflint Trail than stepping from a sauna, gazing toward the skies and viewing the northern lights. Clearwater Lake is located partially inside the Boundary Waters Canoe Area Wilderness, meaning it’s an entry point to one of the most spectacular wild places in the entire country. Canoeing, fishing, hiking and more outdoor adventures than most vacations can offer in a month are available on any given afternoon at the Clearwater Castle. In addition to the beautiful wilderness setting, the town of Grand Marais is only 26 miles away and offers excellent dining and shopping opportunities. With a bustling downtown and live music available on many summer evenings, Grand Marais offers the perfect balance to the pristine setting where the Clearwater Castle stands proudly among the many giant pines of the Boundary Waters.